Popular historic sites such as Zona Arqueologica Teotihuacan and Zocalo are in your itinerary. 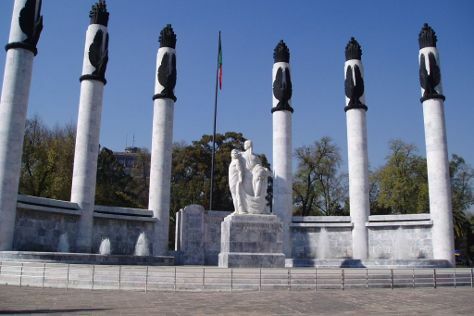 Get outdoors at Chapultepec Park and Poray Biclaturs & Rentals. Step out of Mexico City to go to Tepoztlan and see Tepozteco, which is approximately 1h 20 min away. And it doesn't end there: browse the different shops at Coyoacan, see the interesting displays at National Museum of Anthropology (Museo Nacional de Antropologia), steep yourself in history at Chapultepec Castle, and explore the world behind art at Palacio de Bellas Artes. To find more things to do, photos, and tourist information, refer to the Mexico City travel itinerary creator. If you are flying in from Canada, the closest major airports are Licenciado Benito Juarez International Airport, Licenciado Adolfo Lopez Mateos International Airport and Querétaro Intercontinental Airport. In May, plan for daily highs up to 30°C, and evening lows to 15°C. Finish your sightseeing early on the 9th (Tue) to allow enough time to travel back home.